I will be doing a drop-in workshop for families on the day after Thanksgiving at the Concord Museum in Concord, MA from 11-2:30. It is free with museum admission. There will be four stations in the large room: one to make an accordion book, one to make a stick and elastic book, one to make a hot dog booklet, and one for decorating and adding content. We'll be using recycled materials (provided) and there will be lots of examples and inspiration for you to continue bookmaking at home. I jsut discovered your blog, WOW!! I am soooo excited! 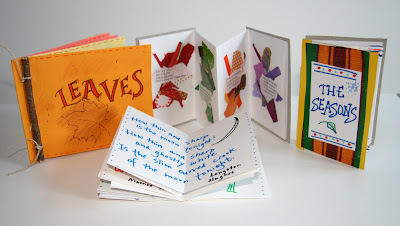 I love making books especially with my son! Thanks for sharing!! !